When you are apartment hunting anywhere in world, it’s a good idea to ask questions and read the fine print before you commit to anything. This is especially true in Japan. Even if the language is not a problem for you, extra fees can push what initially seemed to be an affordable apartment beyond your budget. In this article, we will cover the main fees associated with renting an apartment in Japan. The best way to avoid hidden fees is to understand what they are and where they will (and won’t) appear in typical property listings and ads. Example of a typical listing for a rental apartment in Japan. There is a lot going on here, but we’re going to focus just on the keywords related to the actual upfront and monthly costs. In apartment listings in Japan, the rent (chinryō, 賃料) is always stated as a monthly amount. Sometimes (as in the case with the ad above) the actual word chinryō does not even appear in the listing. In this ad, the agent is advertising a brand new building with seven available units. The rent varies by floor. As is usually the case, the higher the floor, the higher the rent. Unit 101 is going for ¥68,000 a month, while Unit 401 costs ¥74,000 a month. If your maximum monthly budget is ¥70,000 and everything else about the place looks good, then you might think you’re all set to rent Unit 101, but not so fast! 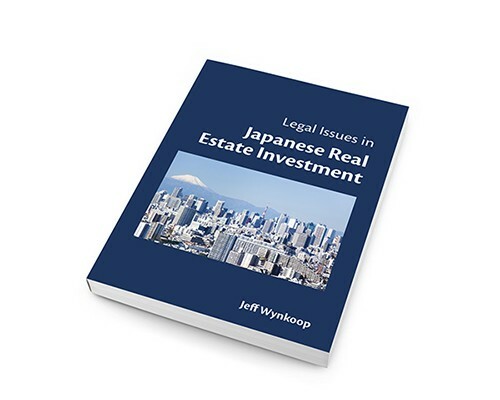 Many rental apartments in Japan charge a separate property maintenance fee, sometimes called a common-area-maintenance fee, which is not included in the stated monthly rent. The maintenance fee pays for the maintenance of the common areas (hallways, elevator, trash room, etc.) in your building. In the ad above, the maintenance fee (indicated by the red rectangle) is ¥5,000 a month. This means your actual total monthly cost to rent the apartment will be: ¥68,000 (stated monthly rent) + Y5,000 (maintenance fee) = ¥73,000. The lesson from this is that the advertised “monthly rent” is almost never the same as your actual monthly costs. 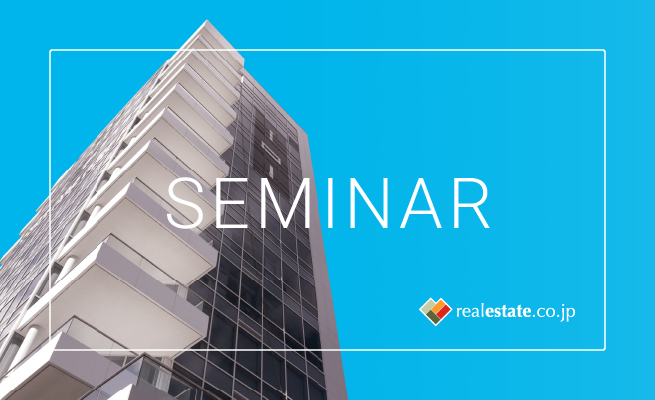 Some owners and property managers purposely set a lower monthly rent so that their property will appear to be less expensive to potential tenants. They apply the difference to the maintenance fee. Of course, your actual out-of-pocket monthly cost is the sum of the two, not just the stated rent. On Real Estate Japan (and all of our network sites, including GaijinPot Apartments, Tokyo Apartment, and Japan Today Real Estate, we have upgraded our rental property listings to make this more transparent. When you search for a property by price, by default, you will be searching for “Total Monthly Costs,” rather than by monthly rent. Total Monthly Costs = Monthly Rent + Maintenance Fee. The sum of the two is your actual out-of-pocket cost per month to rent the apartment. When you search on other online property sites in Japan, you will be searching by monthly rent, so don’t forget about the maintenance fee! Total Monthly Cost = Monthly Rent + Maintenance Fee. On Real Estate Japan and our network sites, by default, you will be shown the Total Monthly Cost of a Property, not just the monthly rent. We’ve mentioned in other posts that because of the many upfront costs charged in Japan, you may be required to have three to seven times the stated monthly rent upfront in cash in order to be able to move in. This is not a hidden cost per se, but in typical property listings, your total cost to move in is never stated anywhere in the ad. For example, in the ad above, the red oval tells you that the landlord is charging one month’s key money and one month’s deposit to move in. Key money is a non-refundable gratuity you pay to the landlord. This is a custom peculiar to Japan. In recent years, more and more landlords do not charge key money, but it is still common throughout the country. On average, key money is equal to one month’s rent. The deposit is a refundable sum you pay to the landlord. Your landlord holds your deposit throughout the term of your lease, and will use the money to pay for repairs beyond normal wear-and-tear, when you move out. On average, deposit is equal to one month’s rent, but for high-end properties, the deposit may be equal to two or three months’ rent. The three items below are usually not stated in property listings but will factor into your move-in costs. What the ad above doesn’t say is that your agent will also charge you on average one month’s rent as commission for helping you find and apply for the apartment. Some agents cut this fee to half a month’s rent, but one month is the average agent’s fee. You will also be required to have a guarantor to rent an apartment. A guarantor is a person or company in Japan who will vouch for you as a tenant. If you fail to pay your rent, your landlord will go to your guarantor to collect. Some landlords and property managers require you to use a guarantor company, rather than put down a friend as a guarantor. In this case, you will have to pay on average one month’s rent for a company to guarantee you for a two-year lease. In almost all cases when you lease an apartment in Japan, you will have to pay the next month’s rent before the last day of the current month. If you move in during the middle of the month, your rent will be pro-rated by the number of days you actually rent the first month. Also, your rent will be calculated from the day your lease starts, not your actual move-in date. On Real Estate Japan (and all of our network sites, including GaijinPot Apartments, Tokyo Apartment, and Japan Today Real Estate, we have upgraded our rental property listings to make your total estimated move-in costs more transparent. Each “For Rent” listing on Real Estate Japan now shows you the total estimated cost to move in. This estimate is the total of five items: the deposit, key money, agency fee, guarantor fee, and one month’s total cost (rent + maintenance fee). The “Total Cost to Move In” calculation assumes that you will move into the apartment on the first day of the month. Looking at the total cost to move in may give you sticker shock, but it’s better to have a realistic idea of what to expect than to be disappointed later on. On Real Estate Japan we will show you an estimated of how much you need to move into the apartment. 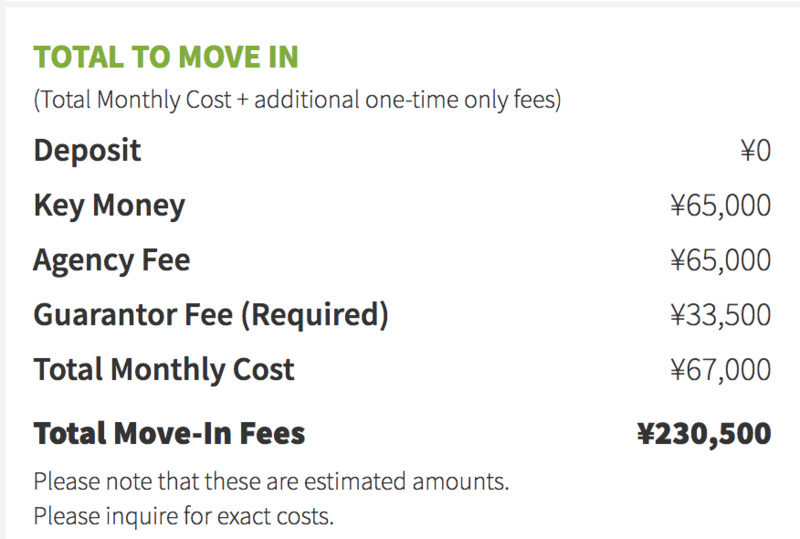 This Total Move-In Fees estimate is for an apartment where the Total Monthly Cost is ¥67,000. The total cost to move in is about 3.4 times one month’s expenses. There are other fees associated with moving into an apartment in Japan. These include the lock-exchange fee and property or fire insurance. The lock exchange fee averages about ¥15,000 and fire insurance averages about ¥20,000 for a two-year policy. Almost all regular residential apartment leases in Japan are renewable leases signed for an initial two-year term. One thing to be aware of is that lease renewal fees are very common in Japan, although there is no law saying that they have to be a standard part of a rental contract. In greater Tokyo, this fee is usually one month’s rent. In the ad above, the orange oval indicates that there is a lease renewal fee equal to one month’s rent. If you think that you might want to stay in your apartment for longer than two years, try to negotiate with the landlord before you sign the contract to have the lease renewal fee removed. Once you sign a contract requiring you to pay a renewal fee, you are legally bound by it. Otherwise, remember to set aside money for renewing your lease when it expires.